This is a continuation from the previous entry which I wrote about the Scala Programming’s setup and IDE installation. In the previous entry, we were successfully setup the JDK, sbt, Scala and installed the IntelliJ. The last step is start coding. Besides using the IntelliJ, you can install and use other IDEs to write codes, for example, Eclipse. It is just a personal preferences. I asked my friends which tools that they are using for Scala programming and I received a standard reply from them, Eclipse. As for my Coursera’s course, the instructor is using IntelliJ and I am going to use it in my virtual machine. I will try to use Eclipse as well on my Windows environment. Come, let try to write a Hello World program using the IntelliJ. And, press the ‘Run’ button on the top. It renders the result on the right side of the application. We need to include the double quotation in our codes. This is our first helloworld. If you want to create an object class file, under the main folder > New > Scala Class > Enter the filename, eg: example.Example > Select Object in the Kind dropdown. It will show the package example and object Example in the screen below. As it is run as main application, you will see a little icon on the left side as below which you can choose Run ‘Example’ or Debug ‘Example’. 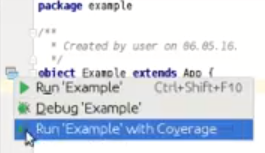 Then, what is Run ‘Example’ with Coverage? Different IDEs will show the result in different mode or presentation but the end result is the same. You can try to use the command line to run and print helloworld too. When I tried it using my virtual machine’s command line by typing scala, it prompted me an error. It is my very first time using command line in Ubuntu to run a scala program. It advised me to install the Scala using the command below. I just did as per advised. It took a while to install when I run it in my Terminal. Can someone highlight to me what causes the error? 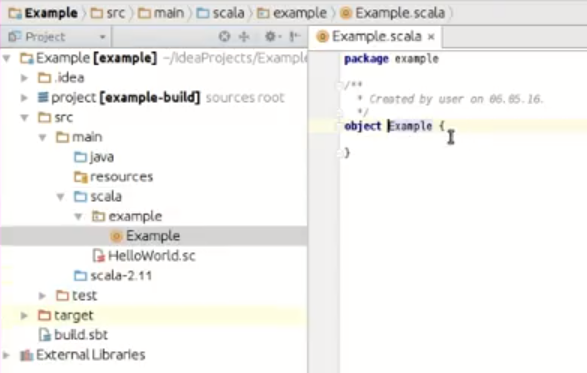 Does it mean that Scala installation on the IDEs is not the same as the Terminal? When the installation is completed in the Terminal, I try again as below and it is correctly displaying the string input I entered.